With a #1 ranking in Money magazine’s Best Places to Live in both 1987 and 1997, Nashua, a small city of 87,000 on the southern border of New Hampshire, aims to become even more livable. Within the span of just a few years, the downtown is expected to have 885 new housing units built: 158 that are already completed, 445 approved, and another 440 being planned. One of the most notable is the proposed Cotton Mill Square which will offer 32 of its 162 new condominium units at $180K, $70K less than the 2005 median home value in Nashua, which is attainable to creatives (entrepreneurs just starting out, artists, teachers) and the working class in the $40,000/year range. 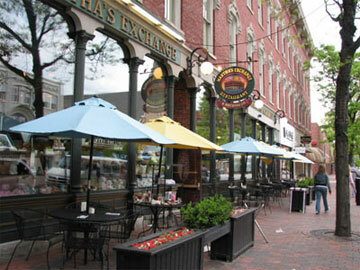 nashua, tres belle ville, calme, propre, bons restaurants. J aime !